Perimenopause and menopause is an integral part of every woman's life. It constitutes about 30% of the female population in India. With the increasing life expectancy, the average woman undergoing natural menopause will spend at least 30 years or more than one-third of her life in the hypoestrogenic state with long-term symptomatic and metabolic complications. Variety of symptoms occurs in 90% of women during these years, most of them are exclusively due to low estrogen levels, and these even affect the quality of life. Hypothyroidism is a condition that can mimic menopausal symptoms very often. Fatigue, mental or physical slowing, forgetfulness, attention or concentration difficulties, and mood disturbances are characteristics of both the conditions. Hence, very often, hypothyroidism can go unnoticed or its symptoms are wrongly attributed to menopause. This runaway of thyroid epidemic seems to be striking menopausal women harder than any other group of patients. It is of importance that even mild thyroid failure can have a number of clinical effects such as depression, memory loss, cognitive impairment, and a variety of neuromuscular complaints. Myocardial function has been found to be subtly impaired. Therefore, routine screening of thyroid function in the climacteric and menopausal period to determine subclinical thyroid disease can be recommended. “Subclinical” hypothyroidism refers to those patients with early or mild thyroid hypofunction manifested as slight elevations of thyrotropin (approximately 4–10 ml U/L) although serum thyroxine (T4) and triiodothyronine (T3) levels are within their reference ranges. Elevated thyroid-stimulating hormone (TSH) in the elderly, especially in women, can be physiological or pathological. History of nutritional status, associated illness, and follow-up with TSH measurement helps to differentiate between the climacteric phase and hypothyroidism in elderly women. Most professional organizations agree for screening in postmenopausal women for thyroid dysfunction. The American Thyroid Association (ATA), the Endocrine Society, and the American Association of Clinical Endocrinologists (AACE) had recommended aggressive case finding in elderly women. Thyroid disorders are one of the common endocrine diseases in India, and hypothyroidism is more frequent than hyperthyroidism. Worldwide, the most common cause of hypothyroidism is iodine deficiency. Hypothyroidism has emerged as the leading disorder worldwide, affecting more than 200 million people in the world (2006). Statistics suggest that 1 in 50 women and 1 in 1000 men develop symptoms of hypothyroidism among 42 million people actually suffering with thyroid disorders in India. Subclinical hypothyroidism is 5%–10% prevalent in perimenopausal women. Potential risks of subclinical hypothyroidism in the elderly include progression to overt hypothyroidism, cardiovascular effects, hyperlipidemia, and neurological and neuropsychiatric effects. On the other hand, hyperthyroidism is associated with osteoporosis which is a significant problem in those women. With this background, we conducted a prospective study in our institute, North Eastern Indira Gandhi Regional Institute of Health and Medical Sciences, to evaluate the abnormal thyroid function tests in perimenopausal and postmenopausal women aged 40–80 years. This is a prospective study conducted in the Obstetrics and Gynecology Department from 2012 to 2016. Women attending our Gynecology Outpatient Department aged 40–80 years were included in this study. Out of those, women who had climacteric symptoms and other gynecological disorder were included in this study. A total of 540 women were recruited in this study. Known cases of thyroid disorder, osteoporosis, and cardiovascular disorder were excluded from the study. Cases with premature menopause or surgical menopause, diabetes mellitus, hypertension, and endocrinal disorder and patients on hormone replacement therapy or on drug altering serum TSH were the other exclusion criteria. Informed consent was taken from all the study participants with assured confidentiality. A detailed history was taken, and thorough clinical examination was done. Thyroid function report was analyzed according to our institute referral range, and the cases are then categorized as subclinical hypothyroid, hypothyroid, and hyperthyroid. Data collected were then tabulated in four age groups: 40–49, 50–59, 60–69, and 70–79 years. Statistical analysis was then performed with SPSS software version 22 (Armonk, NY: IBM Corp.). We could find on analysis of data that in the age group of 40–50 years, we had 271 women with normal thyroid status followed by 71 (23.82%) women with subclinical hypothyroidism, 5 (1%) women with hypothyroidism, and 5 (1%) women with hyperthyroidism. In the age group of 50–60 years, 83 (55.5%) women had subclinical hypothyroidism, 5.1% women had hypothyroidism, and 5 women had hyperthyroidism. In the age group of 60–70 years, 40 (62.5%) women had subclinical hypothyroidism, 7.1% of women had hypothyroidism, and 4 women had hyperthyroidism. Finally, in the age group of 70–80 years, 7 (30.4%) women had subclinical hypothyroidism, 6 (26.08%) had hypothyroidism, and 2 women had hyperthyroidism. In these age groups, abnormal thyroid status was found in 27.1%, 61.9%, 76.5%, and 65.2% of the women, respectively. 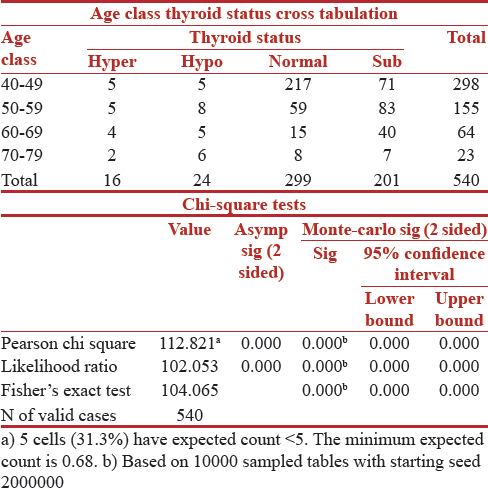 Pearson's Chi-square test showing P = 0.00 indicates that there was a high association between abnormal thyroid status and age [Table 1]. 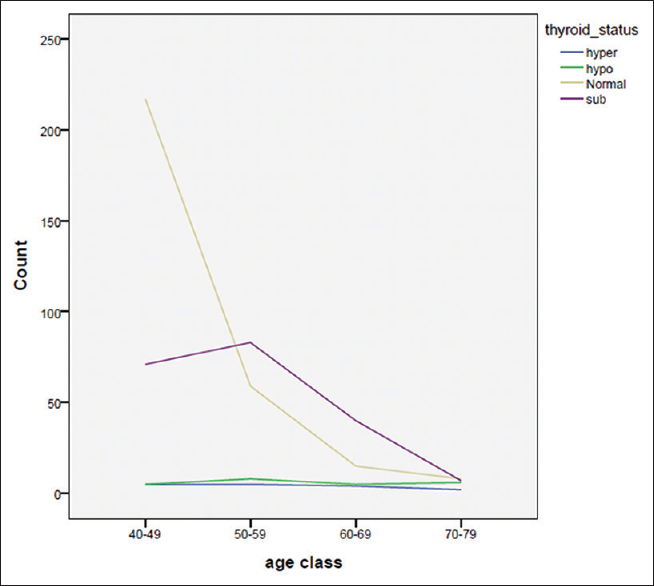 In the graphical representation, there is a sharp decline of the frequency of normal thyroid status from the age group of 40–80 years [Figure 1]. Subclinical hypothyroidism status increases from the age group of 40–70 years and hypothyroidism increases in slow frequency from 40 to 70 years after that there is plateauing. Interestingly, the frequency of hyperthyroidism remains same in all the age groups. Thyroid function and the gonadal axes are related throughout the woman's fertile period. The relationship between the two glands is mutual. In particular, thyroid hormones affect the reproductive function both directly and indirectly through several actions. Studies on the relationship between menopause and thyroid function are few and do not allow to clarify whether menopause has an effect on the thyroid regardless of aging. With aging, the main changes regarding thyroid physiology and function are: a reduction of thyroid iodine uptake, free thyroxine, and free triiodothyronine synthesis and catabolism of free thyroxine. While reverse triiodothyronine increases, the level of TSH remains normal with sometimes a tendency to higher limits. Many of the menopausal symptoms are similar to hypothyroidism. It has been observed that climacteric symptoms are more intense with women with hypothyroidism. Onset increases with age and it is estimated that 26% of premenopausal and menopausal women are diagnosed with thyroid disease. Overt thyroid dysfunction is uncommon in women <40 years old. In our study, 27.1% of women had thyroid abnormality and 23.82% had subclinical hypothyroidism at the age group of 40–50 years. Schindler in their study found that clinical thyroid disease was about 2.4% and subclinical thyroid disease was about 23.2%.in postmenopausal women. Menopausal symptoms are due to changing levels of hormones such as estrogen and progesterone. Estrogen is a hormone that enhances thyroid function. If estrogen levels are low, thyroid functioning also goes down. This is one the main reasons why so many women in menopause and perimenopause end up with thyroid condition. In our study, there was a sharp decline of normal thyroid status from the age of 40 years. A study conducted by Shaikh et al. found that among females of age range 45–50 years, 6 (12.2%) had hypothyroidism, 3 (11.1%) with hypothyroidism in age range 51–55 years, and 8 with hypothyroidism (33.3%) in age range 56–60 years. This study also reports significant hypothyroidism among all three age groups (P = 0.050) and frequency was higher among females of age >56 years with significant P value. We had also P value (0.00) significant among the groups. In the age group of 40–60 years, there was significant subclinical hypothyroidism, and in 60–80 years' age group, overt hypothyroidism was more. Statistics show that one in eight women between the ages of 35 and 65 years and one in five women over the age of 65 years have some form of thyroid disease. This is a hospital-based study and we had number of subclinical hypothyroidism cases rising from 23.82% in age around 40 years to 62.5% in age around 70 years. Again, a number of hypothyroidism patients increased from 1% to 26.8% in the age group of 70–80 years. This might also be due to poor iodine consumption in hilly areas. Looking at the increased risks of thyroid disorders with age, screening of thyroid disorders can be started at the age of 40 years with estimation of serum levels of TSH. This gives us the opportunity to treat both subclinical and clinical hypothyroidism and hyperthyroidism women, which can mimic her perimenopausal symptoms as well as can have other grave systemic complications. Hernández Valencia M, Córdova Pérez N, Zárate A, Basurto L, Manuel Apolinar L, Ruiz M, et al. Hypothyroidism associated to menopause symptoms worsening change with thyroid substitution therap. Ginecol Obstet Mex 2008;76:571-5. Roos A, Bakker SJ, Links TP, Gans RO, Wolffenbuttel BH. Thyroid function is associated with components of the metabolic syndrome in euthyroid subjects. J Clin Endocrinol Metab 2007;92:491-6. Schindler AE. Thyroid function and postmenopause. Gynecol Endocrinol 2003;17:79-85. Shaikh S, Noor F, Azli S, Sajjad S. Hypothyroidism screening in menopausal women. Pak J Med Health Sci 2017;11:14-7. Massoudi MS, Meilahn EN, Orchard TJ, Foley TP Jr., Kuller LH, Costantino JP, et al. Prevalence of thyroid antibodies among healthy middle-aged women. Findings from the thyroid study in healthy women. Ann Epidemiol 1995;5:229-33. Joshi SA, Bhalerao A, Somalwar S, Jain S, Vaidya M, Sherawat N. Screening of peri-and postmenopausal women for hypothyroidism. J South Asian Fed Obstet Gynecol 2011;3:14-6. Preventive Services Task Force. Guide to Clinical Preventive Services. 2nd ed. Baltimore: Williams & Wilkins; 1996. p. 209-18. Ladenson PW, Singer PA, Ain KB, Bagchi N, Bigos ST, Levy EG, et al. American thyroid association guidelines for detection of thyroid dysfunction. Arch Intern Med 2000;160:1573-5. Clinical Practice Guidelines for the Evaluation and Treatment of Hyperthyroidism and Hypothyroidism. Jacksonville: American Association of Clinical Endocrinologists; 1996. Glenn GC. Practice parameter on laboratory panel testing for screening and case finding in asymptomatic adults. Laboratory Testing Strategy Task Force of the College of American Pathologists. Arch Pathol Lab Med 1996;120:929-43. Periodic Health Examination: Summary of AAFP Policy Recommendations and Age Charts, Revision 4.0. Kansas City: American Academy of Family Physicians; 2000. American College of Physicians. Screening for thyroid diseases. Ann Intern Med 1998;Part I:141-3. American College of Physicians. Screening for thyroid diseases. Ann Intern Med 1998;129:143-58. An Update in Obstetrics and Gynecology: Primary & Preventive Care. Washington: American College of Obstetrics and Gynecology; 1998. p. 15.